Europcar – considered the World’s Leading Green Transport Solutions Company by World Travel Awards - is giving Leicester-based businesses and residents even easier access to its services with the opening of a dedicated location at King Power Stadium, home of Leicester City FC. Giving the local community convenient access to car and van hire, the new Europcar branch is located next door to the City Fanstore, with friendly staff on hand to provide assistance with everything to do with hiring a car or van. “Leicester City is a truly local club with a strong fan-base living and working in the area,” said Ken McCall, managing director of Europcar UK Group. “And, as a local employer – with our UK call-centre based in the City – Europcar has a great affinity with Leicester. The new branch expands Europcar’s nationwide network bringing convenient access to a range of vehicle hire services including one-way rentals. Customers can collect and drop off vehicles at the branch, from 08:00-18:00 Monday-to-Friday and from 08:00-13:00 on Saturdays (excluding match days). Reflecting Europcar’s strategy of working with football clubs around the UK, the new partnership with Leicester City FC also includes stadium and perimeter advertising at the Club. 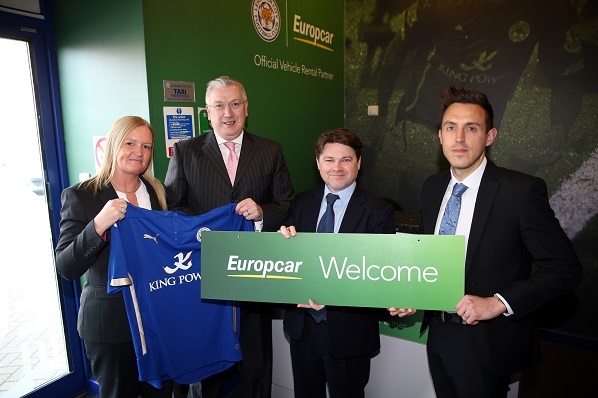 Leicester City commercial director Ian Flanagan said: “We are extremely proud to be working with an industry leader like Europcar and excited by the opportunities the partnership and their in-stadium presence will create for both parties. “Europcar have a fine record of positive activation in the football industry and we are looking forward to utilising that experience for our mutual benefit.